So, today has been my favourite day so far, I think! The weather has been beautiful and I’ve seen some amazing lighthouses (and lots of them). My first stop this morning was Tod Head (pictured). As with many Scottish lighthouses it was in a fairly remote location, at the end of a one-track road. This was fine on my way to the lighthouse, but a different matter on the way back, when I encountered three cars coming in the opposite direction. Not sure Little Car was happy with me, but we made it through! I then stopped just south of Aberdeen at Girdleness. I was lucky with this one and managed to kill two birds with one stone as I could see the strange lighthouse on the end of the pier in Aberdeen harbour from the Girdleness lighthouse. It was a lovely location and I had a bit of a “case of the Flamborough Heads” and was just fascinated by the big old rocks and jagged coastline. I then found heaven in the shape of Buchan Ness. The lighthouse is attached to the village of Boddam by a bridge and you are allowed over the bridge and around the small island as long as you realise it’s private land, basically. Anyway, I fell in love with the place and I think I’ll move in tomorrow! Peterhead was my next destination and, in fact, where I am staying tonight. The views across the harbour are wonderful and the lighthouse on the end of the pier is one of those that is fairly unknown, I guess, now as it’s not owned by the Northern Lighthouse Board. Having plenty of the day left I decided to skip ahead to my next two stops, doing them in reverse order. I was keen to get to Fraserburgh and Kinnaird Head lighthouses, which houses the Museum of Scottish Lighthouses. It closed at 5pm, hence my decision to do Rattray Head on my way back to Peterhead. The museum was fascinating! A brilliant experience. I arrived just in time for the start of a tour, which was given by the manager. 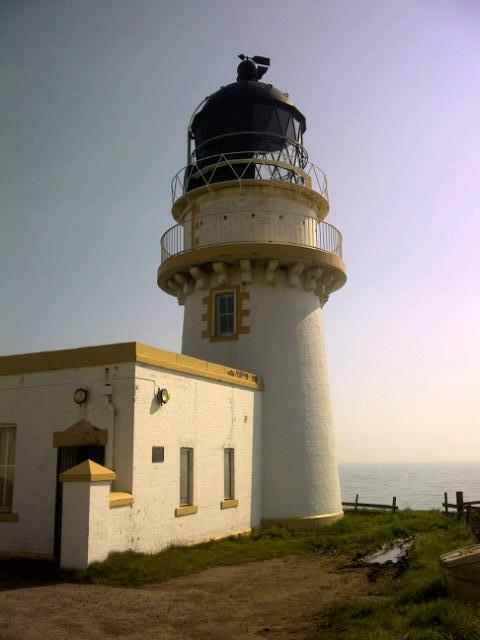 The main bulk of the tour took place in Kinnaird Head lighthouse itself. We (me and a lovely old couple) were shown all of the different levels of the lighthouse, including the spare bedroom for any extra keeper they had to get in and the room where they prepared the paraffin for the lamp. The lighthouse itself was automated in 1991 and a lot of what was there then is still there today. The most exciting part, though, was that we not only got to go up to the lamp room, but he actually let us go inside the optic! It was amazing! He also span the optic around while we were in there (so we could see the view and how the sea looked through the optic, not just for fun). It was brilliant! I’d just like to point out that the big lighthouse we went inside in no longer in use (there is a smaller one next to it instead). My final stop of the day was Rattray Head. Poor Little Car must have hated me again as the road to the car park was long and in really bad condition. We were bouncing around all over the place! She certainly didn’t enjoy that (and neither did I, to be honest). However, once we had parked up I took a long stroll over some huge sand dunes (I felt a bit like I was in the desert at points) and saw the lighthouse, which sits on a stone platform a little way out into the sea. It looked lovely, just sitting there! Sounds like an amazing day. You say this was your favourite day so far, this is my favourite post so far! Being spun inside the optic light sounds a bit vomit making! But I can’t wait to see photos.